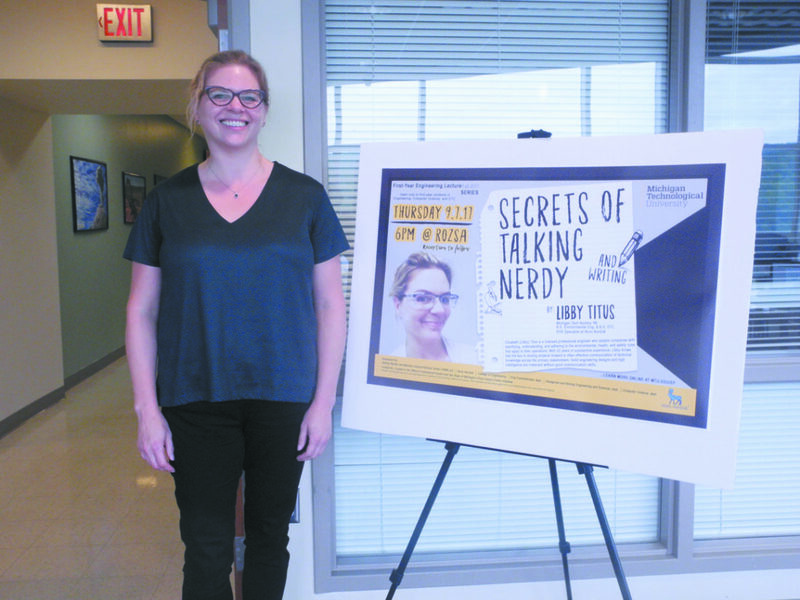 HOUGHTON — Preparing for Thursday’s talk to Michigan Technological University students, alumna Libby Titus talked with a fellow engineering student who said the hardest part of the work wasn’t dynamics or analysis, but people and communication. “That’s where we’re really trying to get the kids to focus, that having effective communications skills is just as important as learning how to be punctual and having good etiquette and good grooming and all the other things you’re required to have to be successful at your job,” she said before the event. Titus gave a talk to 1,200 first-year engineering, computer science and technical students Thursday on the “Secrets of Talking Nerdy.” A 1996 Tech graduate, she now manages regulatory compliance for Novo Nordisk, a biopharmaceutical research center in Seattle. One of the pitfalls she sees in communications in that people often write the way they talk, Titus said, making the writing inefficient and too long. Often, people also write the way they think. For engineers and scientists, that can mean thinking linearly, and writing things in the order they experience them. Or thinking like the scientific method, where they bury the big news after the hypothesis, analysis and results. She also planned to speak to students about jargon and acronyms. Talking among peers, she said, it’s an effective shorthand, and also demonstrates expertise. But those assets turn to liabilities with a wider audience. “In technical writing, especially in the professional world, you don’t always know who your audience is going to include, so it’s really important to use the simplest language possible when you’re explaining things,” she said. Titus graduated with bachelor degrees in environmental engineering and in scientific and technical communication. Since then, she’s worked with clients in the petroleum, chemical, mining, transportation, utility, and manufacturing industries. Coming out of Tech with a desire to save the planet, she ventured “into the heart of darkness,” taking a job with a mining company in Salt Lake City. Titus had heard it looked bad on your resume to leave your first job sooner than three years. She left after three years and one day. From there, she moved to consulting, working with active operating companies on environmental issues and compliance with regulations. Last year, she switched to work with her favorite client, the biopharmaceutical company Novo Nordisk. This is Titus’s first visit to campus since she left. She said her time at Tech had been great preparation for the real world. Between the hard classes and working her way through school, she said, work felt easy in comparison. It wasn’t just the classrooms. Some of the interpersonal skills she uses in her job were developed as a result of living far from home.